Twenty years ago, the Wheaton Alumni magazine began a series of articles in which Wheaton faculty told about their thinking, their research, or their favorite books and people. 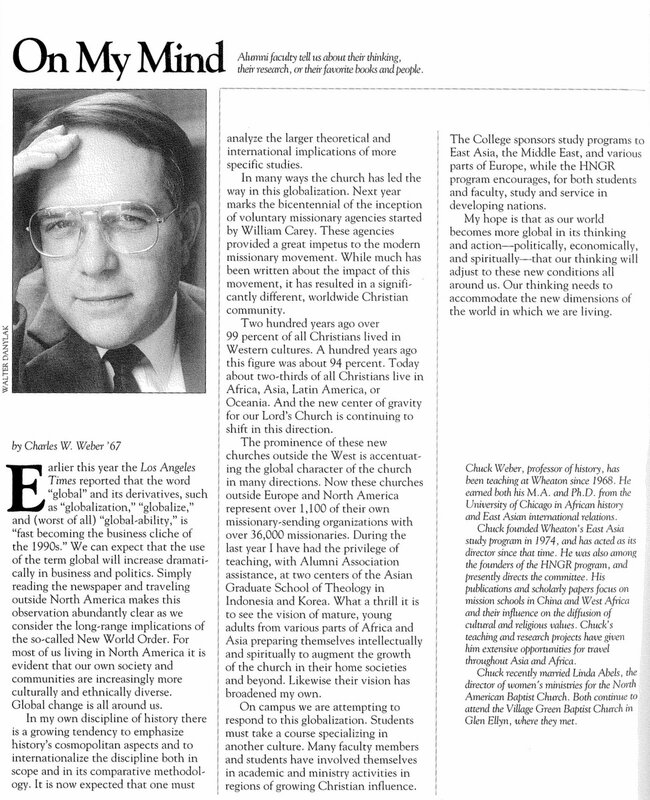 Professor of History Charles Weber was featured in the October/November 1992 issue. Earlier this year  the Los Angeles Times reported that the word “global” and its derivatives, such as “globalization,” “globalize,” and (worst of all) “global-ability,” is “fast becoming the business cliche of the 1990s.” We can expect that the use of the term global will increase dramatically in business and politics. Simply reading the newspaper and traveling outside North America makes this observation abundantly clear as we consider the long-range implications of the so-called New World Order. For most of us living in North America it is evident that our own society and communities are increasingly more culturally and ethnically diverse. Global change is all around us. In my own discipline of history there is a growing tendency to emphasize history’s cosmopolitan aspects and to internationalize the discipline both in scope and in its comparative methodology. It is now expected that one must analyze the larger theoretical and international implications of more specific studies. In many ways the church has led the way in this globalization. Next year marks the bicentennial of the inception of voluntary missionary agencies started by William Carey. These agencies provided a great impetus to the modern missionary movement. While much has been written about the impact of this movement, it has resulted in a significantly different, worldwide Christian community. Two hundred years ago over 99 percent of all Christians lived in Western cultures. A hundred years ago this figure was about 94 percent. Today about two-thirds of all Christians live in Africa, Asia, Latin America, or Oceania. And the new center of gravity for our Lord’s Church is continuing to shift in this direction. The prominence of these new churches outside the West is accentuating the global character of the church in many directions. Now these churches outside Europe and North America represent over 1,100 of their own missionary-sending organizations with over 36,000 missionaries. During the last year I have had the privilege of teaching, with Alumni Association assistance, at two centers of the Asian Graduate School of Theology in Indonesia and Korea. What a thrill it is to see the vision of mature, young adults from various parts of Africa and Asia preparing themselves intellectually and spiritually to augment the growth of the church in their home societies and beyond, Likewise their vision has broadened my own. On campus we are attempting to respond to this globalization. Students must take a course specializing in another culture. Many faculty members and students have involved themselves in academic and ministry activities in regions of growing Christian influence. The College sponsors study programs to East Asia, the Middle East, and various parts of Europe, while the HNGR program encourages, for both students and faculty, study and service in developing nations. My hope is that as our world becomes more global in its thinking and action–politically, economically, and spiritually–that our thinking will adjust to these new conditions all around us. Our thinking needs to accommodate the new dimensions of the world in which we are living. Chuck Weber, Professor of History, has been teaching at Wheaton since 1968. He earned both his M.A. and Ph.D. from the University of Chicago in African History and East Asian International Relations. 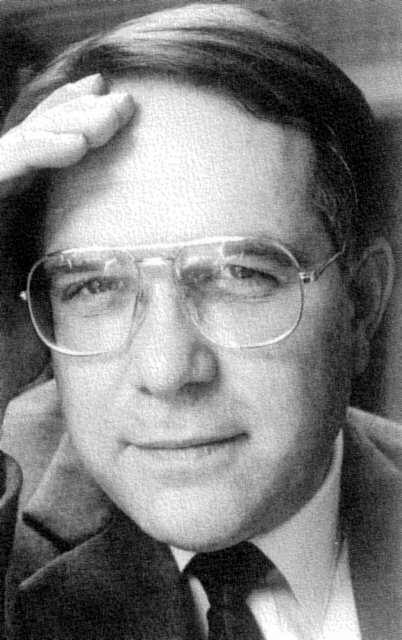 Chuck founded Wheaton’s East Asia study program in 1974 and among the founders of the HNGR program. Dr. Weber’s teaching and research is focused mainly on how African and Asian cultures have developed historically and how they influence the modern world. He is especially interested in how Christians have impacted these societies and the role Christians have played in the development of their national identity.